People cool off in the water of the Trocadero's fountains on August 19, 2012 in Paris. Summers in the northern hemisphere are now warmer than at any period in six centuries, according to climate research published on Wednesday in the science journal Nature. Harvard researchers are adding statistical nuance to our understanding of how modern and historical temperatures compare. Through developing a statistical model of Arctic temperature and how it relates to instrumental and proxy records derived from trees, ice cores, and lake sediments, Martin Tingley, a research associate in Harvard's Department of Earth and Planetary Sciences and Peter Huybers, Professor of Earth and Planetary Sciences, have shown that the warmest summers in the last two decades are unprecedented in the previous six centuries. Their work is described in an April 11 paper published in Nature. "We call upon multiple proxies—-including those derived from trees, ice cores, and lake sediments—-to reconstruct temperature back through time using a Bayesian statistical approach," Tingley said. "What we are trying to do is put statistical inference of past changes in temperature on a more solid and complete footing." "Saying this year is warmer than all other years included in the reconstruction is a very different thing than saying this year is warmer than a particular year in the past," he added. "You have to think about the uncertainty in the temperature estimate for each year, and then be able to say that recent years are warmer than all past years simultaneously." To assess such probabilities, Tingley and Huybers use a statistical model that gives a large ensemble of equally likely temperature histories for the last 600 years, as opposed to the single best estimate provided by most other reconstructions of Earth's temperature. "By sorting through these many plausible realization of what Earth's temperature may have looked like", Huybers said, "it becomes possible to find the probability associated with a great variety of relevant quantities, such as whether the 2010 Russian heat wave was more anomalous than all other events or whether the trend in average temperature over the last 100 years is uniquely large." Perhaps the most basic quantity is average Arctic temperature, and Tingley said that the summers of 2005, 2007, 2010 and 2011 were each warmer than all years prior to 2005 in at least 95% of the ensemble members. Furthermore, the rate of temperature increase observed over the last century is, with 99% probability, greater in magnitude than centennial trends during any other interval in the last 600 years. At a more regional level, the summer of 2010 featured the warmest year in western Russia with 99% probability and also featured the warmest year in western Greenland and the Canadian Arctic with 90% probability. Also notable, Tingley said, was that although summer temperatures are clearly on the rise, they found no indication that the variability of temperature has changed. Events like the 2010 Russian heat wave and the 2003 Western European heat wave are consistent with the increase in mean temperature, after accounting for the fact that they are selected as some of the hottest years and locations. "Insomuch as the past is prologue for the future", Tingley said, "these results suggest that the hottest summers will track along with increases in mean temperature." He explained that, "if instead the distribution of temperatures were becoming wider, as well as shifting towards higher values, then the probability of extreme events would go up even more rapidly." But Tingley also pointed out the limitations of the results and the need for further work. "The proxies, unlike thermometers, generally only give information about seasonal average temperatures, and we have not explored changes in variability at the daily and weekly timescales associated with weather patterns. It will be interesting to further explore instrumental records and higher resolution proxies for trends at these shorter timescales." "These and other recent extremes greatly exceed those expected from a stationary climate." I wasn't aware anyone with an IQ > 14 thought the climate was stationary. Well, there is no debate in any scientific community that climate change is happening. The only humans that suggest the climate is not changing are pundits paid by ultra-neocons who are afraid of science and 1) have zero education or 2) are lying assholes. It saddens me that people legitimately believe scientists are debating weather the climate is changing or not, because they aren't. Hey look Quixote, this article is only 4 sentences long! And it says "warmest". Do you think this means the same thing as the article you noted had only 7 sentences in it? The proxies don't correlate solely with temperature but they go back far enough and the thermometer measurements don't extend back far enough but are somewhat accurate (ignoring UHI effect and blatant manipulation). Graft them together and pow! Science! Only one problem with that. These people are idiots. Hey Sean! Trolling by for a shot I see. The critics will not accept a verdict unless it can be proven with recorded measurements going back to the first life from the slime! With global temperatures cooling, you'd think they would at least try to fabricate a better lie, but then they got to feed the AGW Alarmist Fanatics, before they surface from the depths of their ignorance and see the light. The problem with this finding is that everyone remotely knowledgable of the field knows that a.) climate is not even remotely "stationary". 2. )the date of 1400 is at the coldest part of the little Ice age. So everything from there on has been generally up. 3. 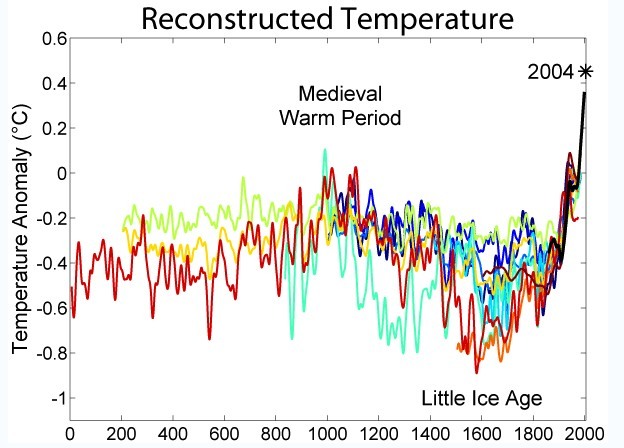 )The little Ice Age was preceded by the Medieval Warm where the temperatures were warmer than today. After all the Vikings--when they first discovered Greenland about 1000 AD did call it Greenland ..... .
there is no debate in any scientific community that climate change is happening. The earth's climate has been warming for tens of thousands years melting the glaciers that covered most of Europe and North America. And before this warming, the climate was changing to build the glaciers, many times. The geological warming trend is continuing. However, here in south east Texas, we had a cold winter and a cool spring which is continuing. ITs great. Hot summers are nothing new, but this kind of improvement is a very encouraging trend. Great for the crops and fishing. The Dems should have done this years ago. AHAHAHAHAHA! XD Sure, cooling. Because every child knows that a rise in temperatures means in fact cooling. Be right back, going to turn my freezer to 220C, it's getting to warm in here. esp. @antigorical- Were you aware that the data from the rapid rise in CO2 lately is from an active volcano? It activity may even be increasing very recently, but I don't have good insight into that kind of info.. So now it's not about "global warming" but only warm northern hemisphere summers? Does this mean CO2 is making the winters unusually cold too? I guess CO2 must be like a magical fairy dust. LOL. The Central England real thermometer record goes back to 1559 and shows the same rate of warming today as ever. It recently plunged back below the boring trend line again. I was curious as to why the AGW Alarmist Zealots are not all over this story. Every argument they have made against those across the divide has been violated by this bit of GW "science". - Cherry picking: Take your starting point 600 years ago when the world was at one of its coolest point. - The MWP was regional: This is from western Russia and MAYBE Canada. I must credit the zealots for receding back to the depths of their..
125000 years before, the climate was quite warmer than today, 2°C to 3°C warmer on several thousand years, the seas were 3 to 5m above the actual level (half of Groenland melted, etc...) all that without any C02 from the small number of homo sapiens at this time !! With the actual large human C02 , we are quite sure of more warmer climate and more rising seas for the next centuries !! Look in wikipedia and phys.org on the fluctuations of the temperatures over the last 5 millions years : it is impressive, passing from small fluctations of the Milankovitch cycles to very large changes, large glaciations and short warming periods, an experimental visual proof of the earth climate becoming strongly unstable, with an amplification factor above 4, without using any complex theoretical model !! The actual human released CO2 warming effect will be strongly amplified, surely, without needing any complex theoretical model, likely more than 125000 years ago !! The CET goes back to 1659. And "central England" is a tiny proportion of the globe. Global Warming requires rather larger sampling than that to reveal it. England has a largely maritime climate and as a result temperatures are heavily dependent/ameliorated by the temperature of the N Atlantic, which has only small variation around the AMO.. Anyone else noticed how the text of this article was changed? Well duh againstseeing that's why it has (Update) added to the title. And sorry, but an active volcano means more CO2 than usual. In fact it is from three sources, the last and singular source being the vocano. The operative word here is HOW, duh. Anyway, this entire study adds up to CHERRY PICKING and a whole lot of nothing, since it was COOLER for 50% of the time. There hasn't been on, has there? Why do you continue to promulgate lies after they have been repeatedly exposed as lies? Specifically Which data did they cherry pick? You are of course, and as always... A liar. Odd isn't how the data constantly shows you to be a liar. It must be because you are a Conservative. The plot you link to doesn't show temperature. so your statement is based upon some unknown form of ignorance. The plot of airborne fraction shows that from 1960 to 1990 the yearly effective emissions of CO2 into the atmosphere was around 60 percent of fuel emissions. Around 1990, the fractional portion remaining dropped to 50%. This implies either greater uptake of CO2 by sinks or a reduction of Co2 production by other sources, or a reduction in the declining uptake of CO2 through land use changes. radek's temperature claims however are just pure ignorance. Hmmm. I don't see this cooling trend that the Conservative Liar is constantly referring to. It's lying appears to be congenital. Of course, the Little ice age was largely regional in scope. Secondly the minimum temperature was reached around the year 1600, not 1400. Year 1400 temperatures were pretty much average. 13,000 years ago the earth was still in an ice age. Tens of thousands of years ago, the earth was in the middle of the last ice age. The exit from the last ice age was abrupt and started 14,000 years ago. Once the maximum temperature was reached 11,000 years ago temperatures have been on a steady decline until recently. RyggTard is old and feeble and just can't seem to remember facts any more. Fantasy he has no trouble remembering. You would think that RyggTard would be able to remember this graph given that it has been presented to him at least 100 times. Now, recede back into the cesspool of your ignorance, Turd. What do you think preserved his body from rotting away within days of his death? "Therefore, 4 out of 8 years was cooler; i.e. 50%"
Your comments are of course about weather. Can you make some about climate? I posted link to the article where is cleary stated that rate of temperature growth is decreasing comparing to previous 25 years period despite highest CO2 emmision. It means that CO2 emmision is not a key factor in global temparature growth (which is fact) . What`s your problem? Are you for real. Can you read and comprehend. My comments were on the article. Cooler than 2005 yes. <-- There is your cherry-picking by this article. Once again, AO fails, or at least pretends to fail, to comprehend the difference between weather and climate. Some scientists say we are cooling, some warming, some that global warming is a lie, others not. All I know that last couple of summers were the hottest that I remember in my short life. Also I didn't see a good 'ol regular summer thunderstorm in 5 years, and they were a normal thing where I live. I don't know whom do I have to believe anymore. Aerosol spraying/geoengineering are heating things up.carnicominstitutedotorg. Idiot. A warmer planet is the more hospitable planet. You can't grow corn in permafrost. Cant grow corn in a dust bowl either. Ignorant (does that make you an idiot) when you find a warmer planet (with higher CO2) results in some food crops shifting their equilibrium so they start producing cyanogens which release hydro-cyanic acid and other changes as plants have excess CO2 to test the waters of biological protection mechanisms. Happens with Cassava - a staple food crop in Africa and also happens to a degree with Clover - a food crop for cattle in Europe. Are you ubavontuba going to adapt to cyanides in vegetable products and the consequences down the line in meats and the other results of a warmer planet also richer in CO2, will you burrow your feeble intellect into the sand or wakeup and ostensibly do something useful so millions wont suffer needlessly - rather than spouting ignorance by long distance ? I must also take issue with this statement on wider grounds than just the obvious. Since mankind has developed and adapted to the conditions at present ( or at least earlier last century ) on this Earth, by definition it is as hospitable as it is ever likely to be already. Otherwise a great deal of organisation/money/effort will be required to adapt to the new configuration of climatic conditions. when you find a warmer planet (with higher CO2) results in some food crops shifting their equilibrium so they start producing cyanogens which release hydro-cyanic acid and other changes as plants have excess CO2 to test the waters of biological protection mechanisms. B.S. Generally, not proven under real world conditions, and not proven to even be a concern. Maybe you think mass extinctions are the result of cyanide poisoning? LOL. Which is already poisonous. They have to process it to remove the cyanide. And, farmers today (for unknown reasons) actually prefer the higher toxicity varieties. and also happens to a degree with Clover - a food crop for cattle in Europe. More B.S. These experiments were conducted under closed conditions with over 700ppm of CO2, and cyanide didn't increase, rather protein decreased (protein is required for the animals to protect themselves from the cyanide). And, cyanide concentrations are much worse when animal forage suffers frost! Whole pastures can become frighteningly deadly! As shown above, people already have! will you burrow your feeble intellect into the sand or wakeup and ostensibly do something useful so millions wont suffer needlessly - rather than spouting ignorance by long distance? It appears the ignorance is yours. You obviously know next to nothing about agriculture. Cyanide increases in a very few crops under enriched CO2 is nothing but a scare tactic by the AGWites. Farmers and agricultural inspectors know how to watch for, and control cyanide concentrations in our food. It's always been a concern, and always will be a concern. There is nothing new here. B.S. Mankind has been around a lot longer than a hundred years, and is the most adaptable creature to walk the earth. Better growing conditions allow for new growth opportunities. What agriculture conglomerate isn't going to take advantage of that? Maybe you simply don't believe in, or understand the agricultural progress of the last hundred years? Maybe your concept of agriculture is the lone farmer, working a plow, behind a plowhorse? LOL. Therefore, it's quite edible to humans and animals we depend on. So, what's your point? Aren't you supposed to be arguing against global warming? I can tell your right now i have seen a change in the weather. In the Okanagan Valley, it has been cold and raining. Not all that normal, it should be warmer in about the plus 20's. Last year, there was so much rain that you couldn't even get a garden to grow. So yeah i do think we're having an effect on the climate i have seen the changes over the last few years. ..not proven under real world conditions.. It has been proven to be a problem in Africa & getting worse, noticeably so especially over last 50 years. ..And, farmers today (for unknown reasons) actually prefer the higher toxicity varieties. Whats the purpose of this claim if its unknown ? These experiments were conducted under closed conditions with over 700ppm of CO2, and cyanide didn't increase..
What experiments are 'these' there are several ? Where do you get the claim (indiscriminate) protein protects from CN. Also we don't have 700pm, you mistakenly assume the biochemistry is linear ! High rate of change doesnt guarantee adaptability. And, as evidenced by the past, freezing is far worse. So, what's your point? Uba I dont appreciate the BS epithet. Not called for in an entirely reasonable positing of opinion. I'm talking about modern civilisation. Of course an adaption will be costly and painful. Certainly not easy. We have 6 Billion plus peeps on the planet in organised societies, not pre-industrial mankind. And even back then millions died during the adaption. Look at great famine of 1315-1317..
Also -so all warming is positive eh? There will be absolutely no dust-bowls? Addressing AGW re reduction in CO2 is not likely at all to manage the additional heat we are imposing on the environment, consequently there is negligible chance of global cooling let alone global freezing. But, since you accept freezing is far worse then you would naturally accept (if at least by classic probabilistic route) that AGW can impact negatively upon sea currents which warm the east coast of USA and some of Europe, with changes in those sea currents its far more likely freezing will occur in both those regions. My main point is to counter the perception that warming is better (regardless of how it arises) due to impact on the factors already mentioned and it should be considered the rate of such change makes timely adaptation across wide cultural & economic zones difficult to progress expediently. Oh, did your CO2 filled crystal ball tell you how AGW can impact negatively upon these sea currents. Demonstrates that toxicity levels aren't a significant concern. So you're saying you didn't do any research on your own claims? Why am I not surprised? Are you really so dense? People have already adapted to cyanide in regards to crop production. Are you suggesting we can't continue to do so? I might agree if it was reasonable, but it wasn't. To presume man cannot adapt to changing conditions is to dismiss the entire history of mankind. I'm talking about modern civilisation. Of course an adaption will be costly and painful. Certainly not easy. How so? Investments of this nature usually pay dividends. We have 6 Billion plus peeps on the planet in organised societies, not pre-industrial mankind. And even back then millions died during the adaption. Look at great famine of 1315-1317.. Irrelevant. We're talking about opening new lands to farming due to warming, not famine as a result of cooling. See? A warming world really is more hospitable. Dust bowls are largely the result of poor land use practices during drought years. Episodic drought is normal. .... To presume man cannot adapt to changing conditions is to dismiss the entire history of mankind. I do know mankind will adapt if forced too, but it will be very painfull. The 3rd world is struggling enough with managing itself and it's food recources as it is. ... Look at great famine of 1315-1317.. Irrelevant. We're talking about opening new lands to farming due to warming, not famine as a result of cooling. See? A warming world really is more hospitable. The case of the Great Famine is of a change from the norm, that had a devastating impact. It would be the same if heat and drought was the cause. Meanwhile your newly arable permafrost has released methane into the atmosphere. In a warming world, drought will become the norm in parts of the world. And the people most affected will be the poor of the 3rd world, where a large majority of the population live. Well away from your new lands open to farming. Then we will have to transport that food thousands of miles to where the majority are starving ( unless vastly costly irrigation is used ). As I said, it will be one hell of an upheaval. Meanwhile the 1st world will still be desperately trying to get/stay rich? My whole point is that warming or cooling, although man will adapt, it will necessarily bring great hardship, maybe not in terms of death to our comfortable lands, but it will. I do know mankind will adapt if forced too, but it will be very painfull. Presumptuous. Change isn't necessarily bad, or even undesired. The 3rd world is struggling enough with managing itself and it's food recources as it is. And more arable land will make this more difficult how, exactly? The case of the Great Famine is of a change from the norm, that had a devastating impact. Only because it got colder. It would be the same if heat and drought was the cause. Meanwhile your newly arable permafrost has released methane into the atmosphere. So? Maybe you don't think organic matter continually releases methane, or thaws and releases methane, every year? In a warming world, drought will become the norm in parts of the world. Says who? Historically, a warmer world has less desert. And the people most affected will be the poor of the 3rd world, where a large majority of the population live. Affected by having more available food and water? How is that bad? Well away from your new lands open to farming. Did you not know the Sahara is greening? Then we will have to transport that food thousands of miles to where the majority are starving ( unless vastly costly irrigation is used ). Cooling is dangerous and deadly. Warming, not a big deal. ...]Presumptuous. Change isn't necessarily bad, or even undesired. .....And more arable land will make this more difficult how, exactly? Again, there's no empirical evidence linking drought to AGW. ....So? Maybe you don't think organic matter continually releases methane, or thaws and releases methane, every year? OK Uba - I give up. I have presented an entirely reasonable/plausible case. I have been trying to feel for any common ground but there is none. All the rebounds you posted were addressed in my post, without the use of the term *B.S.*. As has this post. I have got to the point that Mr Twain summed up so well. UTube, repeating your falsehoods will not make them truths. Expecting that mere repetition will make them any less false is insanity. OK Uba - I give up. I have presented an entirely reasonable/plausible case. It wasn't reasonable or plausible, and it was completely unsupported by references and fact. I have been trying to feel for any common ground but there is none. All the rebounds you posted were addressed in my post, without the use of the term *B.S.*. As has this post. If you would move away from your foolish hand-waving assertions and stick to science and facts, we could find common ground. It's impossible to objectively argue against what are essentially, your personal fantasies. Then it's a good thing I don't utter falsehoods, isn't it? Everything I've said is supportable with widely accepted references. Can you and runrig truthfully say the same? What's really telling is runrig's own reference, by itself, serves to support my point that cooling is deadly and dangerous, warming - not so much. Everything I've said is supportable with widely accepted references. And more libel/slander. Why am I not surprised? Poor deepsand can't support his own arguments, and this pains him. The historical record speaks of prosperity. Uba: Without doubt you are THE most intransigent Denialist on this forum ( a title you will no doubt be proud of ). You call the kettle black with astounding smugness, and by doing so with such smugness, are certain that makes you right. Nothing will touch that shiney ego of yours. It must be great to go through life calling black, white, and accusing others of exactly your actions, though of course yours were entirely warranted. My references are as they are and supported by consensus, plus my own knowledge of 32 years of being taught/working with, the atmosphere. I have not called your opinions as you call mine, though of course they are unreasonable/implausible in the extreme. You cant even understand the implications of a warming world on increased drought ( clue it's to do with a weak jet stream ). You obviously haven't the wit to realise that my last posts to you were the equivalent of a dog lying down on it's back in submissiveness as the dominant dog came to sniff ( as a ploy to see if I could connect ). Yet still you end up being obnoxious. Is that how you get off? You really are a fine example of the lunatic in the asylum that just knows with absolute certainty that they are sane and all other inmates mad. But with this impenetrable smugness with it. You are fighing a lost cause, at least on this forum. It is a science one, as your scores demonstrate. I fully expect you to retaliate to this post, but I will not see it, so as with all your posts it will be a waste of time. As was the civility from me. May as well revert to the vendi method. You reap what you sow sunshine. @ runrig - it is a waste of time, as uba only plays pidgeon chess. How do you make a logical argument to one who does not accept logic? What proof can you provide one who will not accept proof? The more evidence in support of global warming is provided, the more entrenched in the position that it is falsified data he becomes. It is an unwinnable combination. Maggnus: I can take the denialism, it's the smug, because I say so, you stupid boy, attitude ( which would be just about acceptable from an expert ) - it's borderline psychotic - bearing in mind it is my line of expertise. Whatever you do ( readers ) imagine someone turning your professional knowledge on it's head with such know-all smug conceit. Need I say more. I am, of course still absorbing new science, but I have a mind that intuitively realises atmospheric responses. Yet, idiots lured in off the streets expound ( to in their minds ) their infinite truths to the simple-minded and say, no, that's B.S. as a reponse! For F.sake, it's beyond exasperating. I known they are merely the death-throws of dinosaurs who think shouting loudly makes them right, irrespective of expertise. Even in the aforementioned's case expounding the virtues of a warmer world ( as a hedge against being wrong ), and revealing spectacular ignorance of the the physics of the atmosphere in so doing. Yet, of course the massive Dunning-Kruger syndrome, allied with venomous politic conceit, just go to reinforce the moron's sense of self-belief and worth. Note to myself - do some psychological study of extreme personality. He will of course retaliate to this - as I suspect it bolsters his superiority complex. Don't engage him in debate and don't trouble to be civil. I tried it for an experiment and he shat on himself. Don't engage him in debate and don't trouble to be civil. I tried it for an experiment and he shat on himself. Yep, I agree with this and everything else you've said. There is little need to debate or discuss the issues with the cadre of hard-core denialists left, as they do far more harm to their "cause" with their own words then we could do by countering them. There is no debate with those who have already decided what they believe. Its exactly line debating a flat-earther or a believer in the premise the moon landings were a hoax. There is no evidence that will shake them from their belief there is some conspiracy to steal your freedoms, or money, or first born child, or some such. They cannot admit they are wrong, as their self identity has become tied into their belief. It is an exercise in futility. Seriously againstseeing? Using a well known proponant of scientific design as your champion? Did you notice that he actually says the mechanism and method of the deep ocean heat transfer is possible? In other words, he says nothing to counter the findings except that he doesn't think it to be correct. The warming of the oceans below 700 meters has also been identified by Levitus et al. (2012) and Von Schuckmann & Le Traon (2011). Oops that should read that he is a proponant of intelligent design. Speaks to his proclivity to a non-scientific belief system. He argues from the view of his beliefs, not the scientific evidence. Seriously maggnus, if you bothered to read and comprehend the article you would see what a lie your posting is. But, then again not. He agrees the mechanism is possible but the science is fabricated. The more things change the more they remain the same. In the dark ages, the likes of you, would scream to burn the heretics. And now, true to your role of ignorant zealot, you choose to slander. UTube fails to understand that the truth is a defense against the charge of libel/slander. No surprise here, even though such has been previously brought to his attention. The more you talk the less you say. Because, there is only so little that single neuron of yours, can comprehend. In fact, yours is a self-contradictory statement. Let's see if you're bright enough to figure out how that is. LOL. djr fell for this one too. What a riot. And, if these "scientists" had even a basic understanding of thermodynamics and the energy density difference between the atmosphere and the ocean, they would know the ocean depths can't heat up significantly as a result of atmospheric CO2 concentration, without first significantly heating both the atmosphere and sea surface. Frankly, that you bought into it is laughable. Uba: Without doubt you are THE most intransigent Denialist on this forum. What have I supposedly "denied?" Idiot. The only reference you provided completely supported my contentions, and belied yours. plus my own knowledge of 32 years of being taught/working with, the atmosphere. "Working with?" LOL. Wouldn't it be kind of hard to work without the atmosphere? Of course not, as mine are supportable with science, yours are not. though of course they are unreasonable/implausible in the extreme. You cant even understand the implications of a warming world on increased drought. Green, green, so much green! What is even more laughable is that UTube has no grasp of what he's yapping about. He's a kid with a cap pistol who thinks that he's a world class gunslinger. Then why wouldn't you admit you didn't have any references to back up your contention that a warmer world is a drought riddled world? Yet still you end up being obnoxious. So any disagreement is categorically "obnoxious?" Grow up. Is that how you get off? You really are a fine example of the lunatic in the asylum that just knows with absolute certainty that they are sane and all other inmates mad. But with this impenetrable smugness with it. And YOU accuse ME of being obnoxious? LOL. You are fighing a lost cause, at least on this forum. The pursuit of science and knowledge is never a lost cause. I fully expect you to retaliate to this post, but I will not see it, so as with all your posts it will be a waste of time. As was the civility from me. May as well revert to the vendi method. You reap what you sow sunshine. Of course, because the science completely eludes you. @ runrig - it is a waste of time, as uba only plays pidgeon chess. How do you make a logical argument to one who does not accept logic? What proof can you provide one who will not accept proof? What proof? So far, all runrig could provide was a reference which wholly backed my assertions, and belied his own. Please, show me these supposed proofs. The only evidence relevant to global warming, is the global temperature. Everything else is weather. bearing in mind it is my line of expertise. Then why is it so hard for you to provide supporting references? Whatever you do ( readers ) imagine someone turning your professional knowledge on it's head with such know-all smug conceit. Need I say more. So if you can't imagine it, it can't be real? I am, of course still absorbing new science, but I have a mind that intuitively realises atmospheric responses. LOL. Now he thinks he is "one" with the weather! Yet, idiots lured in off the streets expound ( to in their minds ) their infinite truths to the simple-minded and say, no, that's B.S. as a reponse! For F.sake, it's beyond exasperating. So end your exasperation and show me the much requested supporting evidence. If your claims are based on science, you should have evidence. Otherwise, it's only hand-waving B.S.. Indeed. Once the AGWite religion takes hold, it is difficult to deprogram the converted. Grow up, kid, if you want to play with us adults. Deepsand refuses to provide any science to back any of his assertions. I, on the other hand, regularly provide supporting science. Ergo: deepsand is the sophist loser. LOL. Nice call there, deepsand. LOL. deepsand has no argument to make, yet he keeps typing! It is so clear how little you understand, and how biased you are, that it is not even worth the effort to try and show you how little you understand and how clearly biased you are. No wonder most people don't believe so called "denialists" anymore. Just playing pidgeon chess again. Yep; the last sentence succinctly and accurately describes UTube's MO. Obviously, personal attacks are the AGWite shtick. UTube persists in failing to grasp the fact that the truth is defense against charges of libel/slander. So when are you going to start? LOL. Continuing to trot out the same old cherry-picked data, UTube, data that does not even support your position, serves no purpose. A lie, no matter how often you repeat it, remains a lie. Your pointless repetition is egregiously juvenile. Assertions without supporting data are meaningless. ...and, so why do you do that? Why, then, do you persist in doing that? Are you ready to admit the world has been cooling for more than a dozen years (even using the manipulated data which is currently in vogue)? "No, Global Warming Has NOT Stopped"
Then why do you persist in doing just that? Unable to comprehend the article, UTube resorts to attacking the author, who he knows absolutely nothing about, and the forum in which published.